Fall is, without a doubt, my favorite season of the year. I thought I would kick off the months long Fall baking season with pumpkin pie spiced meringue cookies. I developed this recipe from a base meringue cookie recipe. 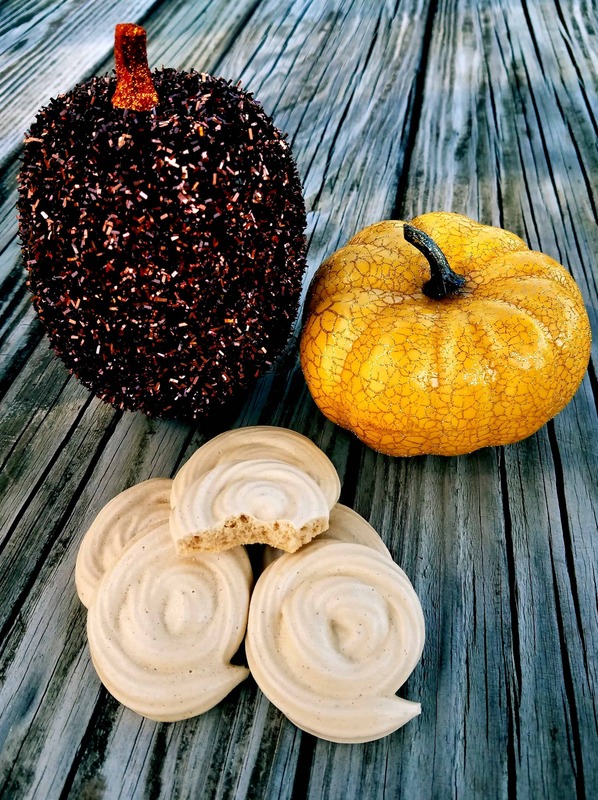 The brown sugar and the homemade pumpkin pie spice work well together and make this meringue cookie extra special. These meringue cookies are so light and fluffy! 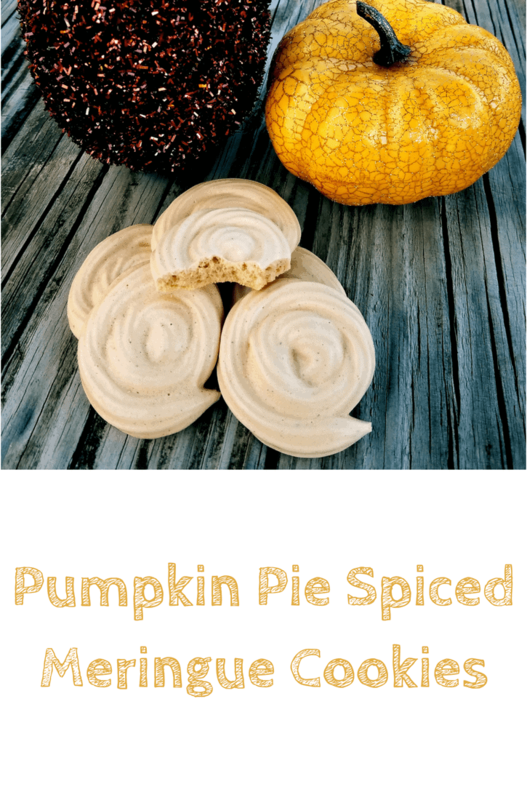 The combination of brown sugar, pumpkin pie spice, and vanilla make these a great fall treat! With an electric mixer, whip egg whites on high until soft peaks form. Add brown sugar, cream of tartar, vanilla, and pumpkin pie spice a tablespoon at a time into the mixture. Whip eggs on high in between additions. After all dry ingredients are added, continue to whip on high until stiff peaks form. Spoon meringue mixture into a ziploc bag with the corner cut off and pipe cookie shapes onto an aluminum foil lined baking sheet. Alternatively, you can line the baking sheet with parchment or silicon paper. You must line your cookie sheet with one of the three, otherwise the cookies will not come off! For the cookies in the photo above, I used Wilton #30 piping tip and starting in the center, made two swirls in the counterclockwise direction. Bake at 200F for at least 2 hours. Check them every 30 minutes. Don’t let the meringues brown. The meringues are done when they are dry to the touch. After you are done baking, turn the oven off and let the meringue cookies continue to sit in the oven (~3-4 hours). Peel them off the aluminum foil and store in an airtight container. I have also had good luck with freezing them, after they have cooled down. My little sister loves meringue! This is perfect for her school snacks. Thanks for sharing! I love meringue! It’s so light, sweet and delicious. And the idea of adding in pumpkin is perfect! You have me so excited from fall with these mouth-watering Pumpkin Pie Cookies. I am always thrilled to find new spins on old classics we love. Looks delicious! Alas, I’m clueless with flour and meringue will be a chore but I gotta start small with muffins lol. I love fall and all things pumpkin. These cookies sound so delicious. I am a fan of meringue. I will have to try making these this fall. I love fall and all things pumpkin. These cookies sound so delicious. I am a fan of meringue. I definitely will give these cookies a try. Thanks for the recipe. I will try to make them using your method. I tried making some before. They tasted fine but they did not look nice. Haha. I think adding pumpkin spice would be nice!